Windows 8 includes a Control Panel widget called “Create a recovery drive,” that you can use to create a USB flash drive to boot up and repair your system should anything go wrong with the boot or system partitions. And if your PC includes a custom-built recovery partition (something you’ll have at your disposal when the machine comes from an OEM, or the system builder has taken the trouble to build a recovery partition as part of the initial system install), you can even move it from its present location on the system/boot drive to the flash drive to free up space. This can be especially helpful on tablet, notebook, or other PCs with smaller (less than 256 GB) system/boot drives, where every GB of storage space really counts. A typical recovery partition might be as big as 10-15 GB: on a 64 or 128 GB SSD, that’s a significant amount of storage space. The first screen for Recovery Disk lets you know if you’ve got a recovery drive to copy or not. I built one of my Windows 8 test machines from scratch, and installed Windows 8 over Windows 7 on the Lenovo X220 Tablet, so neither of those machines had a recovery partition for me to copy. However, after setting up a recovery drive for my desktop Windows 8 machine, I then turned to RecImgManager to create a refresh image for that machine on the same 32 GB flash drive where the initial recovery drive materials were deposited. Since the base level files consume only 223 MB of disk space (this proved to be the same for both desktop and notebook PCs, so I must believe that this holds true for all 64-bit Windows 8 PCs). The refresh image for my X220 Tablet is 8.5 GB, while the one for my i7 2600K desktop is 7.5 GB so you could easily use a 16 GB flash drive, instead of the 32 GB unit I employed for this maneuver. 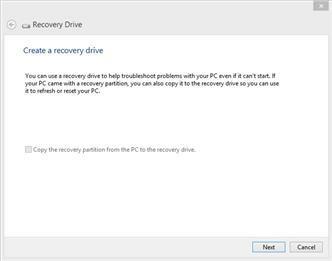 The combination of the recovery drive functionality and a refresh image means you can start up Windows 8 from the USB flash drive, but some additional work is required to re-create a usable environment on a target PC. You must basically convert the .wim into an install image, so that you can then install that image to rebuild your machine. The good news is this custom install will include your drivers and applications; the bad news is, you must jump through a few hoops to make this happen. Fortunately, it is all nicely explained in a forum thread over on the Windows Eight Forums entitled “recover Windows 8 from a .wim file.” I’ll be fooling around with this in my spare time over the next week or two, and will report further as I learn more.